Virtual Router Manager for Windows 7 - an application for organizing a wireless connection between multiple devices. The program uses a direct connection type to create a virtual bridge between two computers and a virtual network mode for sharing the selected Internet gateway. The functionality of the utility allows you to specify the type of connection, the name and password of the future hotspot, set the network visibility parameters using lists of allowed mac addresses. The application consumes a minimum of system resources, can show the number of users and network activity in real time. 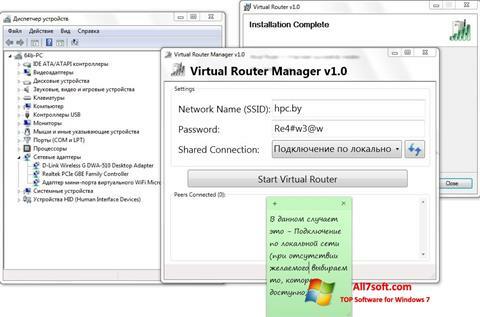 You can free download Virtual Router Manager official latest version for Windows 7 in English.